Former President Barack Obama demanded unspecified “common-sense gun safety laws” after the Florida school shooting on Wednesday that left 17 people dead. “We are grieving with Parkland. But we are not powerless. Caring for our kids is our first job. 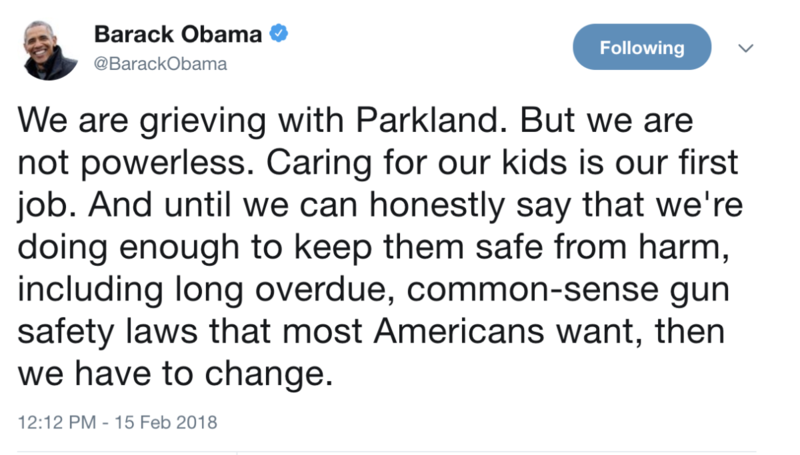 And until we can honestly say that we’re doing enough to keep them safe from harm, including long overdue, common-sense gun safety laws that most Americans want, then we have to change,” Obama wrote in a statement posted to Twitter. The shooter, Nikolas Cruz, passed a background check when he purchased the AR-15 he used to carry out the shooting. Obama used the Texas church shooting in November to demand America “reduce the violence and weaponry in our midst.” Then, too, he did not present any concrete solutions.